"Yellow Dwarf Star" is the colloquial term for a G-type main-sequence star. Our own Sun falls into this category. Star classification is very exact, with all these stellar objects having an alphanumeric designation consisting of a letter, a number and a Roman numeral. Taking our Sun as an example, it is a G2V star. The "G" is the spectral type - the "yellow" bit, the "2" relates to the hotness of the star within this category and may range from 0 to 9 and the "V" is the brightness factor indicating a main-sequence star. The size of yellow dwarf stars ranges from slightly smaller than our Sun to slightly bigger. The "yellow" bit of the name is a bit misleading, as the colour of these stars can be anything from white to only a little bit yellow. I suppose it's to distinguish them from "white dwarfs", which belong to a totally different class of star. This is worked out by studying the spectrum of light from the star. This will indicate the abundance of different chemicals within that star's photosphere, which, in turn, tells scientists the surface temperature of that star. The "G" classification indicates that the temperature of a yellow dwarf star can be anything between 5,200 and 6,000 degrees Kelvin. As already stated, this temperature range can be further subdivided, using the numbers 0-9. Zero is the hottest. 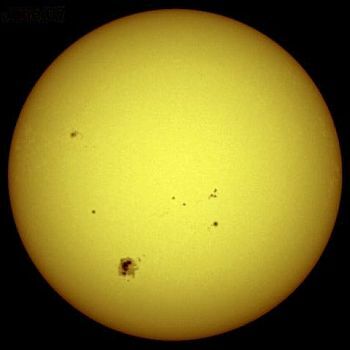 As the Sun is a G2V, it is quite hot within its category, with a surface temperature of around 5,700 degrees. The Roman numeral "V" specifically indicates dwarf main-sequence stars. These are simply defined as those that fuse hydrogen into helium. They comprise the majority of stars in the sky and most have enough hydrogen to keep this process going for billions of years. 7.5% of stars are yellow dwarfs and they are brighter than 90% of all other stars. Certain stars within the G V category are used as standards to represent each of the numeric subdivisions of it. The two missing ones, G7V and G9V have yet to have stars assigned to them.